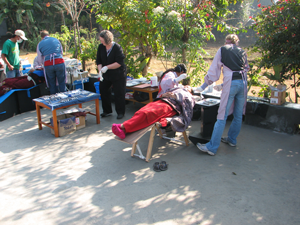 Through feedback we have received about portable dental chairs from mission dental projects and expertise represented in our club in relation to dental service projects around the world, the Rotary Club of Newberg Early Birds is providing TotaChair, a light weight “tote-able” dental chair. Designed and developed by dental professionals, this chair is fabricated and assembled by Rotarians donating their time and talent, and made available for use in mission dental outreach projects, or for local uses. 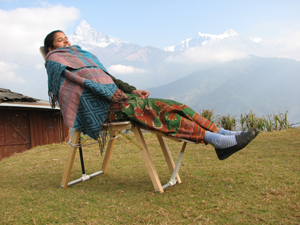 It is designed as a compact and transportable chair for use in temporary operatory settings in remote regions of the world. The uses for this “tote-able” chair will not be limited to dental uses exclusively. The convenience and simplicity of this portable chair will lend itself to many different uses for service projects. There is no qualifying requirement for purchase of this unit, but we believe every non-profit that provides mission service work, whether medical or dental related, will find this chair an invaluable compliment to their equipment. World Dental Relief has identified the following key criteria for for portable dental chairs. TotaChair complies with all the criteria listed. A portable dental chair must be lightweight and durable, yet easily folded down to a dimension that makes it easy to carry and transport to the location of service. Airlines have a maximum size and weight allowable for luggage. Presently that is 50 pounds and maximum total dimension (H+W+L) of 62 inches. A portable dental chair should deliver the patient to the dentist in a manner that is easy for the dentist to have good access and lighting for the procedure he is performing. A portable dental chair should have a thin narrow back and be fully adjustable for the comfort of the operator and patient. There should be a good headrest and arm support for the comfort of your patient. It is almost impossible for patients to hold their heads still without a good head support. A portable dental chair must be adjustable for various procedures including both stand up and sit down dentistry to suit the operator. The adjustments should be conveniently located and easy to operate. A dental chair must be stable while in use and not subject to tipping over with the patient. A portable dental chair must be easily cleaned for a wide variety of circumstances. Its frame and upholstery should be made of materials which can be wiped with germicides and not deteriorate.